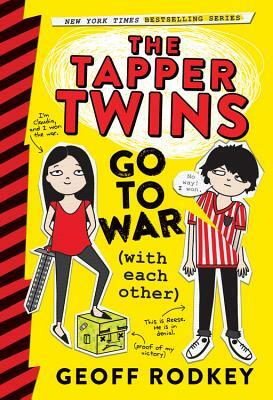 This bestselling first book in the Tapper Twins series is a hilariously authentic showcase of what it's like to be in middle school in our digitally-saturated world, told as a colorful "oral history" with photos, screenshots, text messages, chat logs, and online gaming digital art. Twelve-year-old twins, Claudia and Reese, who couldn't be more different...except in their determination to come out on top in a vicious prank war. But when the competition escalates into an all-out battle that's fought from the cafeteria of their New York City private school all the way to the fictional universe of an online video game, the twins have to decide if their efforts to destroy each other are worth the price. In a starred review, Publishers Weekly declared "This uproarious series opener... is packed with both laugh-out-loud moments and heart." Don't miss the further adventures of the Tapper Twins in The Tapper Twins Tear Up New York, The Tapper Twins Run for President, and The Tapper Twins Go Viral. Geoff Rodkey has written the hit films Daddy Day Care (starring Eddie Murphy), RV (starring Robin Williams), The Shaggy Dog (starring Tim Allen), and the Disney Channel original TV movie Good Luck Charlie, It's Christmas. He is also the author of the middle grade trilogy The Chronicles of Egg, and following next books in the Tapper Twins series: The Tapper Twins Tear Up New York, The Tapper Twins Run for President, and The Tapper Twins Go Viral. He lives in New York City. *"This uproarious series opener... is packed with both laugh-out-loud moments and heart."